Bring water to a boil in a small saucepan over medium heat; add sweet potato; cook for 5-7 minutes. Drain. Set aside. Roast bell pepper on grill or gas stovetop. Turn frequently until skin is evenly charred. Place in medium bowl. Cover with a kitchen towel for 10 minutes. Peel skin under running water. Remove seeds. Chop into 1/2-inch cubes. Place sweet potato, bell pepper, ginger, oil, miso, and broth in a blender or food processor, in 2 or more batches if necessary; cover with lid and kitchen towel. Blend until smooth. If consistency is too thick, add water. 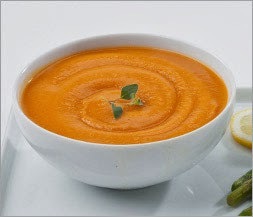 Heat soup in a medium saucepan over medium heat; cook, stirring frequently, for 4 to 5 minutes, or until hot. Add Bragg Liquid Aminos and seasoning blend if desired.